A judge finds conspiracy and cannoli in 19th-century Italy. A routine financial investigation takes a turn for the murderous. Two lifelong enemies locked in a nightmarish feud. 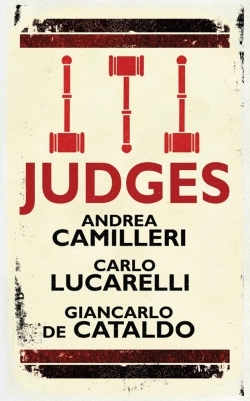 Camilleri, best known for his Inspector Montalbano series, presents the charming Judge Surra who moves to a small Sicilian town in the late nineteenth century. He does not quite understand the quirky welcoming gifts from the locals, but nothing stands in the way of his quest for justice – and pastries. Lucarelli brings us a far darker story. Judge Valentina Lorenzi – La Bambina – is so young and inexperienced she hardly merits a bodyguard. But when she barely survives an assassin’s bullet, her black-and-white world of crime and punishment turns a deathly shade of grey. In The Triple Dream of the Prosecutor, De Cataldo, a judge himself, crafts a Kafkaesque tale of a lifelong feud between Prosecutor Mandati and the corrupt Mayor of Novere. When the mayor narrowly escapes a series of bizarre assassination attempts, Mandati begins to realise that all his dreams may just be coming true. From Italy’s premiere crime authors, three novellas from every tradition of crime writing.